After roughly 18 months of hacking, chopping, digging, and shredding the overgrown foliage on our estate it is now time to actually put things back, in this case it involves constructing a planter box. The torrential rains last year had Dale outside digging canals in an effort to route water around the house to drain the yard. 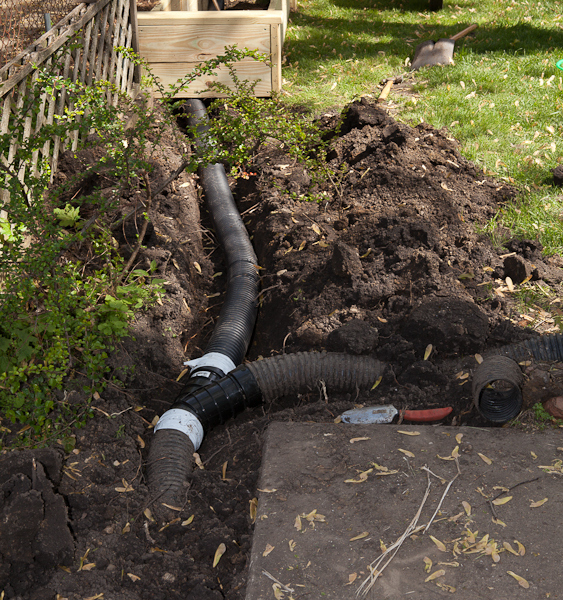 That experience, plus this year’s thaw, and the endless sump pump running the past couple of months has moved yard drainage to the top of Dale’s list. Our backyard has a pretty serious slope as evidenced by the photo below, and there are two other sloping yards feeding their rain runoff and snowmelt to our back yard. 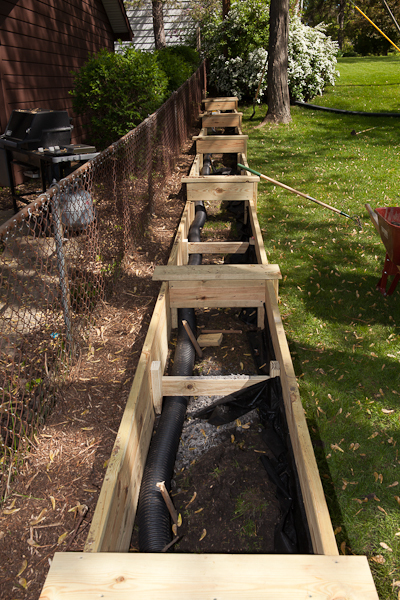 Phase 1: Installing a French drain on our property running the full width of the yard that will feed two lines running down each side of our house. 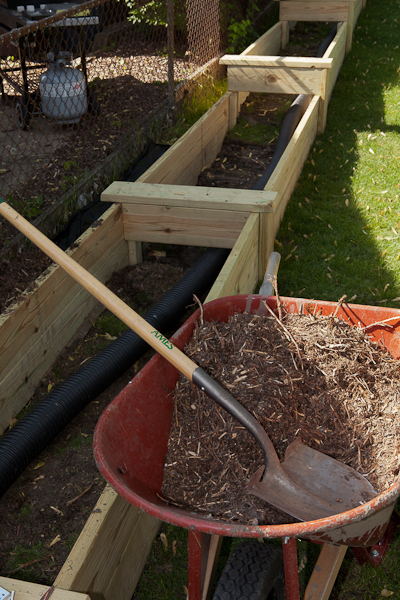 Phase 2: Installing a small retaining wall with two more French drains, one at the top and one at the bottom of the wall and each tying in with two lines running down either side of the house. We hope to plant flowers to attract butterflies and humming birds as well. 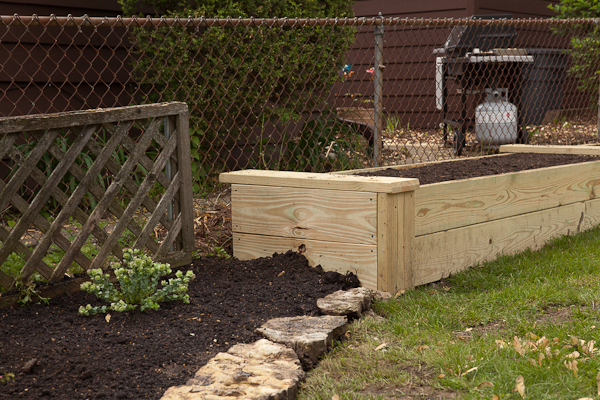 In all it took about seven trips to Home Depot for wood, 2 yards of “compost”, 2 yards of dirt Dale had me sift through some screen thing he concocted, and 2 yards of fresh planting mix dumped in our driveway. Following are photos from the day we filled it. 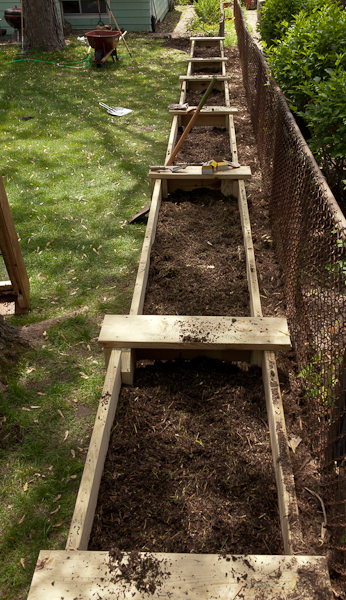 First we ran the drains under the planter box(es). 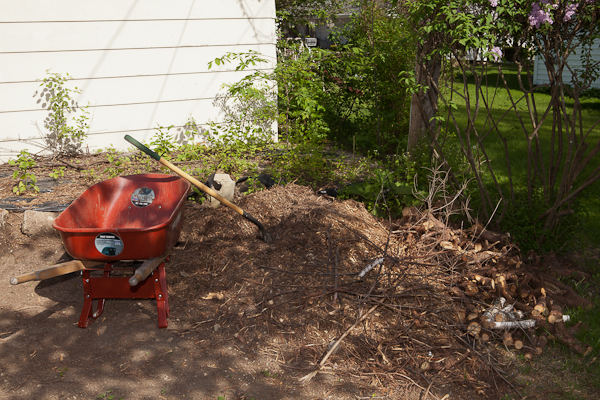 We had tons of yard waste and clippings shredded from last year to serve as a mulch base. 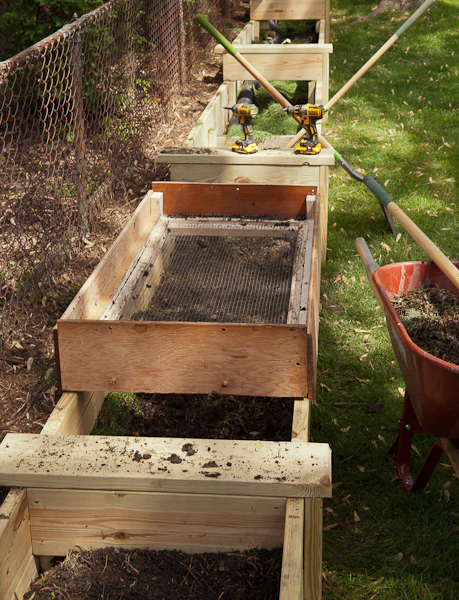 On top of that we had soil we sifted and added from other parts of the yard. And for the final/top layer we brought in good soil to grow our first garden–We are getting our first sprouts now and they are coming up quickly! I’m sure we’ll post pics of those later. Quite the impressive planter situation, Dale! And, at the front, Dale put together a little planting area. I added the ornamental oregano you see here! 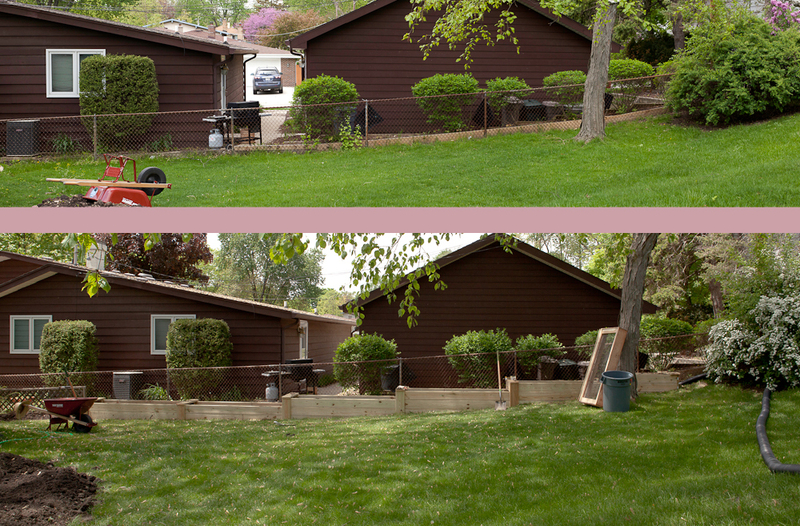 Here’s a fun before and after shot of our garden area that hides our drainage. The brown house is our next door neighbor’s and they are really nice!